From Marlo Thomas, the #1 New York Times bestselling author of The Right Words at the Right Time, comes a one-of-a-kind collection of inspiring stories about ordinary women who have reinvented themselves in extraordinary ways. “You can be anything you want to be.” “Reach for the moon.” “It’s never too late to make a change.” We’ve heard it all. But anyone who has ever tried to make a big life change knows that it can be a bit more complicated—and scary—than that. How do you get up the nerve (and confidence) to actually take the leap? 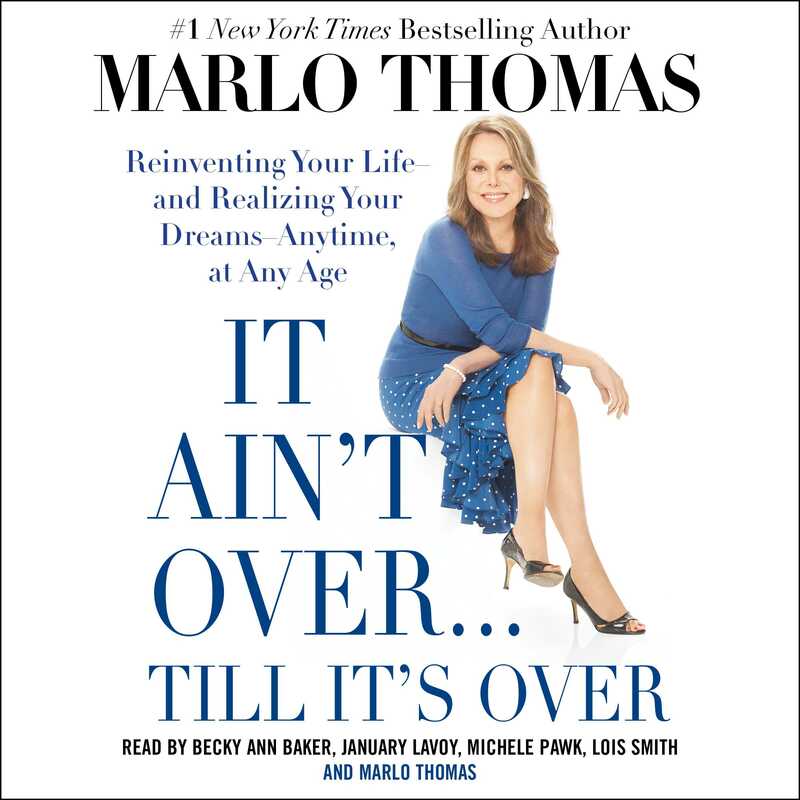 No one knows better than the women profiled in this powerful audiobook by actress, activist, and bestselling author Marlo Thomas. Using the same kinds of personal stories that made Thomas’s landmark collection The Right Words at the Right Time a blockbuster success, It Ain’t Over…Till It’s Over introduces us to more than fifty amazing women who are proving that it’s never too late to live out a dream—to get a PhD, travel the world, launch a business, indulge a creative impulse, make a family recipe famous, or fill a void in life with a challenging new experience. Meet a homemaker who fulfilled a childhood ambition by going to med school at age forty-three; a widow with three young kids who turned a jewelry-making hobby into a successful business on Etsy; a woman who lived out a childhood dream by taking a cross-country trip (on horseback, no less! ); and a sister and mother who channeled their immense grief from losing a brother and son in 9/11 into creating a global foundation to care for the emotionally wounded. Brimming with anecdotes that will inspire smiles, tears, and—most of all—hope, It Ain’t Over speaks to women of all ages with an empowering message: The best is yet to come. Marlo Thomas graduated from the University of Southern California with a teaching degree. She is the author of six bestselling books: Free to Be…You and Me; Free to Be…a Family; The Right Words at the Right Time; The Right Words at the Right Time, Volume 2: Your Turn! ; Thanks & Giving: All Year Long; and her memoir, Growing Up Laughing: My Story and the Story of Funny. Ms. Thomas has won four Emmy Awards, a Peabody Award, a Golden Globe, and a Grammy, and has been inducted into the Broadcasting & Cable Hall of Fame for her work in television, including her starring role in the landmark series That Girl, which she also conceived and produced. She is the National Outreach Director for St. Jude Children’s Research Hospital, which was founded by her father, Danny Thomas, in 1962. In 2010, Ms. Thomas launched her website, MarloThomas.com, on The Huffington Post and AOL. She lives in New York with her husband, Phil Donahue.